Flea Treatment – Our team will help you get rid of these pests in your home and around your yard. Flea Control can come in a wide variety of methods and most customers call us after they've attempted a DIY Flea Treatment. However well established the flea issue is, we have a proven Flea Treatment record of eliminating them. Our Pest Controllers understand flea habits, breeding and life cycles which is extremely important in delivering an effective, targeted program. If you have just moved into a new home and have fleas you may not have brought the issue with you. Fleas can stay dormant for up to 18months. Then become extremely active when they sense vibrations and go on the hunt to seek a suitable host. This can be extremely frustrating especially if you don't have any pets yourself. Fence lines are also flea hot spots with eggs falling off the host dog into the grass to then hatch and make their way into your place. Fleas Bombs from the supermarket can be effective but they put chemical residue EVERYWHERE. Most people wouldn't like having chemicals landing on their kitchen benches, lounges, pillows and even the remote control. We do a targeted, effective flea treatment to known hotspots and breeding areas. This is all done with a low toxic chemical which is safe around your family and pets. How to get rid of Fleas! The best way to be flea free is with an effect treatment from our Flea Treatment Team. It will take two treatments for effect flea control and this is why. A Female Flea can lay up to 30 eggs a day and these can hatch in as quick as two days. What is most scary is that flea rapidly grows through its life cycle and is capable of laying its own eggs within 4 weeks. From eggs to the next stage (larvae) is one to two weeks. So we need to put down a second treatment to target the 3rd stage of the fleas life (adolescences). These guys can stay dormant for over a year so don't avoid previously affected areas. We need vibration from foot traffic to trigger activity and have them out and about jumping over our treatment. The second flea treatment is done approximately 2 weeks after the first. Anything over this time frame will make our process less effective. Not all biting insects are the same and most of the time fleas cop the blame. Even though they are tiny they can still be seen easily. Their overall size hovers around 2mm in length and are brown in colour. The odd shaped body is tall and thin and unlike bed bugs the body shape doesn't change after feeding. 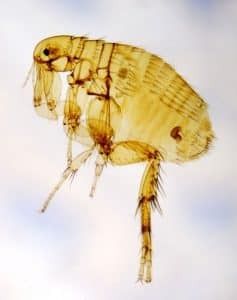 For their size, fleas have long legs which gives them the ability to jump 200 times their height. Flea bites will be commonly found on your feet, lower legs and sock line. Look for a relatively round red area with a small dark red spot in the middle. The itch can last for several hours and may cause a different reaction to people with extreme cases having a hives outbreak. Help us help you - Before your Flea Control Treatment! Time is of the essence. As soon as you notice a flea infestation then it's time to act. The Outside - Before the first treatment all the lawns have to be mowed as short as possible. All lawn clippings need to either be bagged up or put in the garbage bin away from the treatment area. Mowing the grass short without a catcher or using the clippings as mulch will only spread the eggs further around the yard. Pet bedding and sleeping areas will need to be thoroughly washed and may require a possible treatment. Inside - Floors whether tile, timber or carpets will need to be vacuumed and moped/cleaned. As well as any lounges or other material furniture. The flea usually starts its life cycle in carpet, cracks in flooring, lounges and dog bedding. We ask for this to be thoroughly done as you will not be able to clean for at least a week after the first spray. Our Flea Treatment technician will be able to give you accurate time frames on the day. It is imperative that all pets are treated on the same day of the first treatment. We recommend contacting your local vet for guidance into what product would be most appropriate. Cats will have a different type of flea on it than dogs. The "Cat Flea" will chow down on almost any host while the "Dog Flea" will generally stick to dogs. There is no difference in our treatment for either flea type. You get a three month warranty to ensure the current flea infestation has been eradicated. Three months is the lifespan of the active ingredient in the chemical we use. The treatment is not a flea barrier to protect the house from further attack but to break the breeding cycle of the current problem. The initial flea control treatment should have solved the issue well before the three month mark. For maximum effectiveness the customer MUST treat any pets on the same day or before the initial treatment by us. Failing to do this might void your three month warranty and make for an ineffective program. Our two treatment Flea Control Program costs $280 which includes Gst. We reserve the right to change the price for larger properties over 650m2. So time is of the essence. Give our Flea Treatment Team a call to organise a time that suits you on 1800UNCOVER (1800862683) or use our online form.